Normally, you equate animal lovers with people who volunteer at an animal shelter or donate to a "Save the _______" campaign. But a certain world leader has taken his compassion for animals to the extreme. And one of his acts of animal activism may have gone too far (literally), when a Siberian tiger released by Vladimir Putin swam to China. Last May, Putin oversaw the release of the 19-month-old cub, Kuzya, and five other rare Siberian tigers into Russia's Amur region. Kuzya, now 23 months old and ready for greener pastures, reportedly swam across the frigid Amur River and into the Chinese province of Heilongjiang. Chinese forestry officials first spotted Kuzya on Thursday and have since been on a close watch for the rare animal, who Russia fears may fall into the hands of poachers. Chinese officials reported Saturday that they may have found Kuzya's hair, feces, and tracks. Chinese wildlife expert Ma Jianzhang told Chinese state-news service Xinhua that wildlife regularly crosses the Chinese-Russia border because the competition for food isn't as fierce. While I certainly hope that Kuzya makes a safe return to Russia, can we also note that this is the most terrifying lost pet ever? Putin's tiger is literally running across borders and pillaging other countries for food. Who'd the tiger learn that from, d'ya think? "Putin's little tiger ran all through the land, eating and eating and eating, until it reached the mighty Amur River. 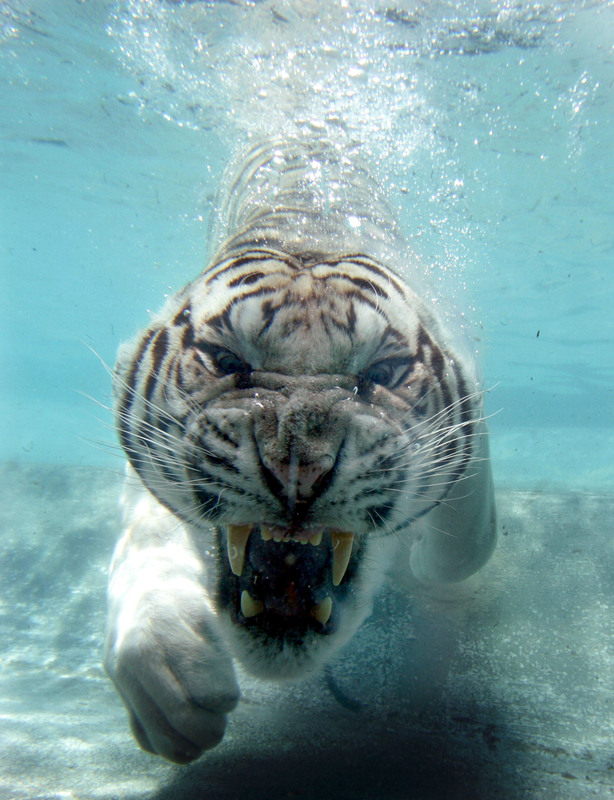 The tiger was still hungry, and even the frigid waters were no match for Kuzya's desire to conquer (and eat). On the other side was a whole new land to explore, which just so happened to be the land of Chinese President Xi Jinping...for now." Actually, the recent strong relations between Russia and China may work in Kuzya's favor. Given Putin's love for animals and the Chinese's respect for them, Chinese officials are scrambling to locate Kuzya and make sure that the rare beast stays out of too much trouble. Still, some aren't predicting a happy ending for little Kuzya, saying that the tiger could end up as a rich person's decor. With only 25 Siberian tigers in China, its hide could go for big bucks on the black market. It has even been suggested that Kuzya is a Russian spy (really). I wonder if Putin is putting up "Lost Tiger" signs right now.